Looking for a charming homestay surrounded by greenery? 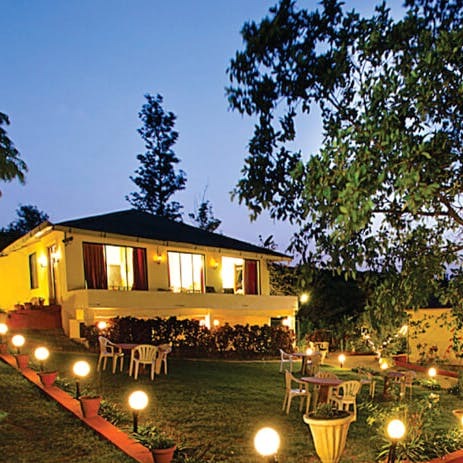 Honey Wood Holiday Homes at Mahabaleshwar offers great villa stays with garden and forest views. Honey Wood Holiday Home is a traditional homestay with 1000-square-feet villas equipped with two bedrooms, a hall and a dining space. There are four kinds of villas at Honey Wood, but our favourite is the premium forest chalet with a private balcony perched on the edge of the forest. The ambience is quite romantic and serene. The management ensures that every guest experiences the utmost privacy and homely hospitality. The chalet is well-appointed with LED TV, attached bathrooms and round-the-clock hot water. If budget is a constraint, you can always go for either the ground or top floor villas, starting at INR 2200 per room. The forest chalet ranges between INR 2,900 and INR 3,500 depending on the season. We recommend you add a meal plan that costs about INR 395 per person. The plan comprises a wholesome breakfast (with eggs, toasts, poha and upma) and a home-cooked dinner with gravies, sabzi, roti, dal tadka, chicken curry, salad and sweet dish.